OMR or Chennai’s IT Corridor conjures up images of a long stretch filled with concrete and glass buildings and sprawling compounds. However, the last five years have seen OMR grow to a burgeoning locality and one of the city’s real estate hot spots. From Thoraipakkam to Sholinganallur and Navalur to Siruseri, OMR is currently the “it” place to live in. But no matter where you stay, you will need to step out every once in a while for food be it breakfast, lunch, dinner or even tea-time! That’s where OMR delivers, and how. 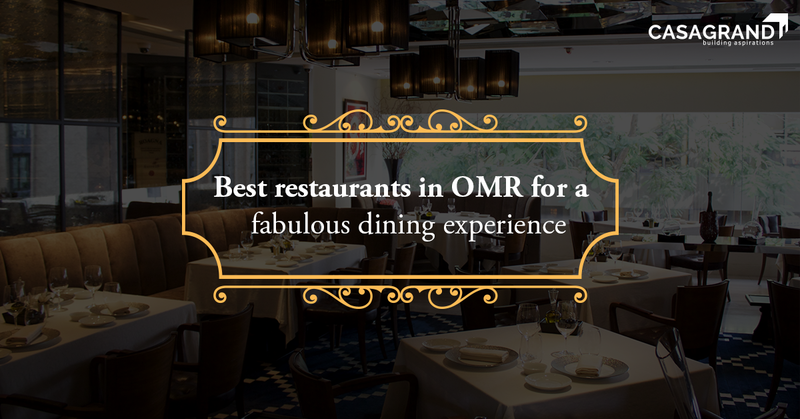 Read on for some of the best restaurants in OMR. Onesta offers diners the best of Italian food including mouth-watering pizzas, delicious plates of pasta and desserts. For aficionados of Italian cuisine, Onesta is a must visit! Their modern, yet cosy ambience makes it the perfect place to relax after a long day at work or a special dinner with your family and loved ones. Be sure to head over to Onesta, one of the best restaurants in OMR and try their most popular dishes including the ravioli, bacon pizza and lasagne. As soon as you step foot into the Black Pearl, you will be transported to a world of Davy Jones, pirate wars and treasure hunts! Keeping with its international theme, Black Pearl offers patrons multiple cuisines including North Indian, Mediterranean, European, Continental, American BBQ and much more. Not to mention, Black Pearl also provides you with the option of a buffet so that you can eat to your heart’s content! Don’t forget to sample their pizza, chicken wings and paan ice cream that will pleasantly surprise you. Craving some authentic North Indian fare? Then make your way to Delhi Highway. Located in Shollinganallur, Delhi Highway offers patrons scrumptious North Indian cuisine that is sure to hit the spot. Take your pick from their massive thalis, buttery dal makhani, decadent lassis, lip-smacking pani puris, and of course, sugary jalebis. Combining contemporary décor with some old-school North Indian motifs, Delhi Highway will transport you to a popular dhabba just outside of Delhi. The Farm offers a rustic, idyllic ambience, perfect for nature lovers and those who enjoy the simple pleasures of life. Not to mention, pet owners are encouraged to bring their pets along! So now your entire family can enjoy an outing without any member being left behind. The Farm focusses on Indian fare with a number of dishes from other cuisines as well. Be sure to try their homemade cheese platter, along with their delicious Mango Lassi, hearty Spinach Soup and refreshing Hibiscus Soda. Located in IBIS Chennai, Spice It is a popular choice for those who can’t decide between North Indian and South Indian fare. Trendy red accents adorn this quirky restaurant creating a lively atmosphere. In fact, if you’re looking for the perfect location to celebrate a family dinner or special occasion, then look no further than Spice It, one of the best restaurants in OMR. Their party hall seats a capacity of 85, and their head chef personally helps you personalise your menu. If you’re in OMR, don’t give Spice It a miss. Hola in Shollinganallur is yet another hidden gem in the list of best restaurants in OMR. Offering a wide range of global cuisine, from Mexican to Chinese, Italian to North Indian and Chinese, Hola serves up appetising meals that are hearty, delicious and comforting. Take in their welcoming décor and peaceful ambience while you munch on some of their signature dishes including the thin crust pizza, Caprese salad, cheesy nachos and vegetable risotto. You can also check out their breakfast, lunch and dinner buffets available throughout the week for a fun family outing. Located inside Novotel in OMR, is an exclusive fine-dining restaurant perfect for families of all sizes. No matter what your favourite cuisine, you will be able to find something you love at The Square. Take your pick from their dum biryani, juicy burgers and a wide range of pizzas. As one of the best restaurants in OMR, The Square also offers buffets for breakfast, lunch and dinner. Completing the list of best restaurants in OMR is Pedreno. Offering a combination of Mexican, Italian and Asian cuisine, Pedreno combines three of the most popular global fare under one roof. Start with their cheesy garlic bread, then try one of their succulent burgers, sample their momos and then end with their gelato. No matter the time of day, you will find something to quench your thirst and appetite at Pedreno. With such fantastic options as the best restaurants in OMR, you won’t have to hesitate about purchasing a home in the area. Head over to Casagrand for superior homes that let you live life in style.